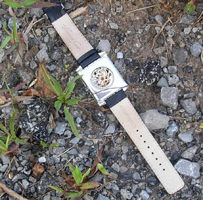 When I was trying to clean up some of the trash along Newsom Station Road, I found this watch on the side of the road. The backing and battery were missing. The watch was broken. I’m not sure why the wearer didn’t repair it or give it away. Instead someone tossed it, and it became litter. More stuff for the landfill that could have been recycled. I hate to see things that could have been reused just littering our roads.